If you know me at all, chances are you've received some kind of snail mail from me over the years. Birthday cards, Christmas cards, baby announcements, and Just Because cards. I love to send and receive real mail. So I'm always on the lookout for fun stationary. Enter Minted. The brainchild of a mom seeing her friends with talent getting no exposure, she decided to start an online crowd sourced stationary company. Anyone can enter a design and it's then voted on by the community (and all you have to do is create an account to vote). The top vote getters are offered for sale and the designers get commission on their art. Pretty sweet idea if you ask me! Minted offers something for everyone. From holiday cards to birth announcements, birthday party invites to any and all wedding stationary. Everything can be completely personalized and is customizable. You can even have your wedding invites matched to a specific Pantone color! 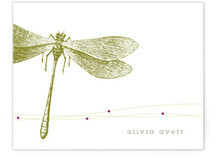 Of course right now I'm shopping for 1st birthday party invites and just plain cute personal stationary. This is one of my favorites! Who do you send cards to? Minted is offering a very generous giveaway. $100 credit to their site. To enter please fill in the rafflecopter form below! Giveaway ends at midnight on February 9th and is open to anyone in the world! I have been compensated for my time to write this post. As always, all opinions are mine! I love the water colored lotus design! I love everything about Minted! We used the Wonderful Life design for our Christmas cards and the quality was great. I really like the Animal Alphabet art print! Passing Notes Thank You Card. I would get some personalized holiday cards. I would love one of their framed prints! I'd get some personalized journals!